Goldman Sachs (^GS) delivered better-than-expected first quarter earnings per share but missed on revenue, amid a steep drop in trading. Revenue for the quarter came in at $8.81 billion, missing analysts’ forecasts of $8.97 billion. The $8.81 billion figure is 13% lower than the revenue posted during the first quarter of 2018. The drop reflected lower revenues in the institutional client services and investing and lending businesses. Goldman’s results largely reflected what analysts had already anticipated would be a tough quarter for big bank trading, given the volatile market conditions. Elsewhere, revenue from equities trading plunged 24% from a year ago to $1.77 billion primarily because of “significantly lower” net revenues in equities client execution, especially in derivatives. What’s more, trading volumes were lower impacting fees and commissions. “During the quarter, equities operated in an environment characterized by improved market conditions, however client activity and levels of volatility were both lower compared with the fourth quarter of 2018,” the bank stated. Meanwhile, investment banking revenues, part of Goldman’s bread and butter, were flat at $1.81 billion from the first quarter a year ago — and 11% lower than in the fourth quarter of 2018. Within investment banking, financial advisory revenues were 51% higher than a year ago at $887 million, driven by an increase in mergers and acquisitions. Yet underwriting revenues dropped 24% to $923 million, due to an industry-wide decline in IPOs and fewer leveraged finance transactions. Goldman also boosted its quarterly dividend to 85 cents per share. Shares of Goldman briefly popped in pre-market trading, but trended lower ahead of the bell. 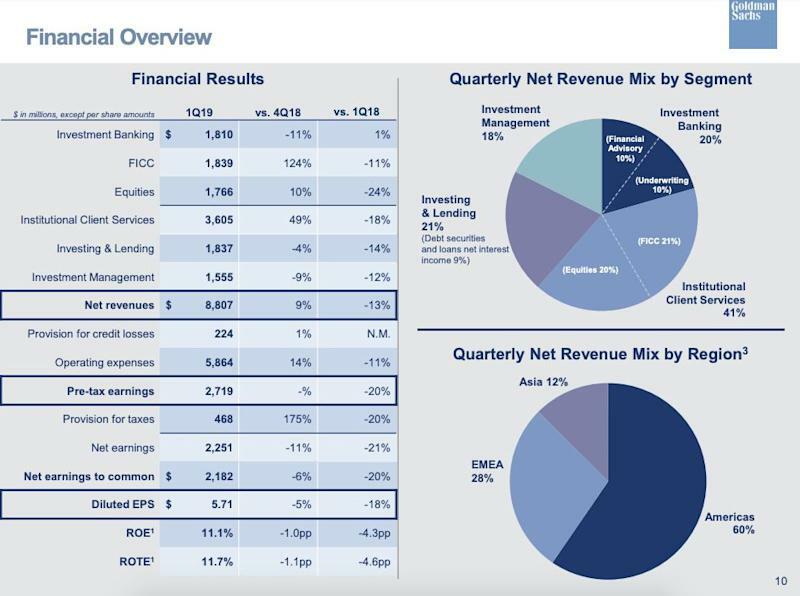 Here's a breakdown for the net revenue for business segments at Goldman Sachs during the first quarter.